Later this morning, I'll be drawing for the 13 Snackalicious cookbooks to be given away. Participation exceeded expectation, and it was a delicious treat reading scrumptious recipes from both bloggers I know and bloggers I met through the carnival. I'll be adding links to Super Bowl appetizer recipes as I come across them, so if in the future you're looking for something "good to eat", you might "trick or treat" on the Snackalicious/Recipe Round Up link page :). And to continue with the fun, I decided to join Shannon at her quarterly Bloggy Giveaways by giving away little surcies ALL WEEK LONG! 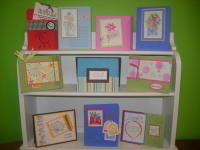 Today's prize is going to be a set of Stampin' Up notecards & envelopes similar to these. All you have to do to be eligible is leave a comment on this post. If you're interested in the give-aways for the rest of the week, please check back daily; in case you're the curious type, I'm giving away books, french-milled soaps, jewelry...and a gift card...! Simple treats, yes, but free? Fun? Delightful little surcies? I think so :). Comments for this prize can be left on this post until 2/3/08; if you can read and have a snail mail address, you're eligible!